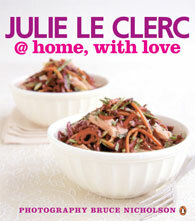 Julie’s immensely popular café @ home and feast @ home cookbooks are brought together in this single volume to offer more than two hundred of Julie’s uncomplicated and stylish recipes to savour with your family and friends. In this special edition bind-up of two books in one, Julie shows you how to bring the seductive flavours of café food to your own home and table with her signature flair. From warm family dinners to important occasions, with Julie’s tips and hints you can create a gorgeous, no-fuss feast that allows you to relax and indulge with the people you care about – at home, with love.